Following the largest National Guard mobilization in Kentucky history, involving the state’s entire Army National Guard plus some Air and Marines, hundreds of thousands of people are still without power five days after a massive ice storm ravaged the state. I have one question. Where’s FEMA? No, I have two questions. Here’s the second: where is the media, screaming that the President doesn’t care and has not sent federal help in the wake of a massive natural disaster? Isn’t that what happened after Hurricane Katrina? Don’t they still talk about the uncaring and incompetent Bush administration that failed to help the suffering people of Louisiana and Mississippi? During the summer, by the way, when no one was in danger of freezing to death. Still no FEMA. Still no federal aid. Still the media doesn’t care. I guess natural disasters under Democratic presidents are local responsibilities. The President doesn’t care if he turns a recession into a Depression. Can you say Smoot-Hawley? Can you say union payoff? The Washington Post reports on a controversial provision in Obama’s stimulus package, one that could make the recession worse and affect the world’s economies. Similar to the Smoot-Hawley act that essentially helped create the Great Depression, this provision forbids the use of foreign iron and steel in any stimulus project. Proponents of expanding the “Buy American” provisions enacted during the Great Depression, including steel and iron manufacturers and labor unions, argue that it is the only way to ensure that the stimulus creates jobs at home and not overseas. Sources close to the issue say it appears a response is still being formulated. I’ll bet. There are no easy answers to this one. Welcome to the real world, Mr. Obama, where actions have consequences. It’s not Just Words anymore. We have the interesting spectacle of politicians and Global Warming True Believers like Al Gore jockeying to get the most spectacularly outrageous headlines in the news, while real scientists are coming out in droves to disavow the AGW theory. Interesting. Meanwhile, Obama’s new Climate Czar is a True Believer as well as a socialist. Maybe that’s why Obama isn’t sending FEMA to help out in Kentucky – just think of the reduced carbon emissions from 600,000 people without power. But what worries me most is that the credibility of science may never recover — and perhaps it shouldn’t. [emphasis added] Credibility has to be earned, and once it’s squandered may never be recovered. By now far too many scientists have knowingly colluded in an historic fraud, one that would put Bernie Madoff to shame. 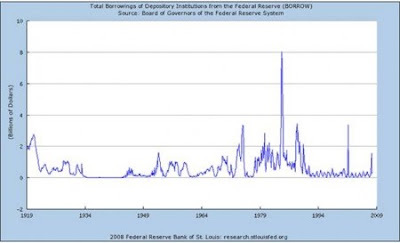 We are seeing political larceny here on a truly planetary scale. Why should scientists who’ve gambled their own reputations on this fakery ever be trusted again? They shouldn’t. Would you entrust your life savings to Bernie Madoff? Right. …It’s been flamingly obvious for years now that the hypothesis of human-caused global warming violates all the basic rules and safeguards that protect the integrity of normal, healthy science. That’s why AGW (anthropogenic global warming) looks like a massive fraud, the biggest fraud ever in the history of science. If that’s true, anybody who cares about science should be outraged. Even if you don’t care about that ask yourself if you want your next medical exam to be honest. Or the next time you drive across a traffic bridge, do you want the engineering tests to be falsified? If scientific corruption becomes endemic, we risk losing one of the great jewels of our culture. All in pursuit of power. Hooray to the Illinois state senators, who voted unanimously to remove Rod Blagojevich from office as governor. At least now we don’t have to worry about him running for President. Operation Board Games must be viewed with a full understanding that Governor Rod Blagojevich was supposed to be the candidate running for president during this election cycle in order for the subplots involving Obama to become clear. The Illinois political mob already had a major fundraising operation in place for Blagojevich by 2004, and its safe to assume that when Obama and Rezko first started setting up the real estate deal for the mansion and lot in December 2004, Obama never thought about any repercussions on his run for president. This report will show that the same political mob raising money to make Blagojevich president in 2008, also funded Obama’s election to the US senate in 2004, which is also discussed further in the earlier articles in this series. And here you thought the Democratic party moved their headquarters to Chicago so they could enjoy the weather. You also thought primaries were decided by the voters, not ahead of time by the Illinois political mob. Pringle wrote a series of meticulously detailed articles last spring about Blagojevich, Obama, the inner dealings of The Combine (corrupt Illinois political machine) and their Board Games. Her most stunning allegation is that Obama became the replacement candidate for president in 2008 after Special Prosecutor Patrick Fitzgerald got too close to the truth about Blago. If the media had looked, perhaps they would have seen how close Obama was to Blago, too. pub[l]ic officials by listing them in indictments for no reason and the only two political candidates identified as receiving campaign money from Operation Board Games kickback schemes are Illinois Governor Rod Blagojevich and the US Senator from Illinois, Barack Obama. Instead of referring to Board Games as the “Rezko” case, before long the media will likely be calling it the “Blagojevich” case. However, because the governor did not become the presidential candidate, when the scandal is recorded in the history books it will be the “Barack Obama” case. Evelyn Pringle thought information about Obama’s associations and dealings would be the end of his presidency bid. She did not count on the corrupt /incompetent (take your pick) media shielding him. Find links for the whole series at this website. Some of them load slowly; be patient. Lots of names, dates, quotes, connections – fascinating. What Does It Mean To Be A Republican? Are you a Republican? Why? What drew you to the party in the first place? Do you think the party has lost its way? Sweetness & Light has a terrific list of 20 fast facts about the Democratic stimulus package. Did you know that the cost of this one package is almost equal to the entire amount of annual discretionary spending by the federal government? Did you know if they divided it up and gave equal shares to everyone living in poverty they would each get $22,000? Did you know it will make billions of dollars available for groups like ACORN? Did you know all the members of The Accountability and Transparency Board overseeing this package will be appointed by Obama with no Congressional oversight? The “stimulus package” is really a giant Christmas package for the Democrats. Guess who’s paying for it. Retired NASA senior atmospheric scientist Dr. John S. Theon says he is proud to add his name to the growing list of international scientists who do not believe in Anthropogenic Global Warming theory. Theon declared “climate models are useless.” “My own belief concerning anthropogenic climate change is that the models do not realistically simulate the climate system because there are many very important sub-grid scale processes that the models either replicate poorly or completely omit,” Theon explained. “Furthermore, some scientists have manipulated the observed data to justify their model results. In doing so, they neither explain what they have modified in the observations, nor explain how they did it. They have resisted making their work transparent so that it can be replicated independently by other scientists. This is clearly contrary to how science should be done. Thus there is no rational justification for using climate model forecasts to determine public policy,” he added. The global warming house of cards is falling apart, and Al Gore is set to testify before Congress. As usual, when he is scheduled to speak the country suffers from The Gore Effect. This time it is severe weather extending from Texas eastward to the Atlantic. The Ohio Valley has gotten sheets of ice and almost a foot of snow since yesterday afternoon, and points eastward are being pummelled. AmericanThinker says Internet search engines show political bias – again. Over five years ago a blogger created a “Googlebomb” that made George Bush’s official biography show up as the top result if you searched for the phrase “abject failure.” It has been that way ever since, although Google claims they “attempted to neuter the prank in 2007” but were only partly successful. Bush’s biography was on a page of the official presidential website though, so guess what new president’s biography shows up now? Correction: Guess whose biography showed up until a few days ago? Once alerted by a New York Times article, Google, Yahoo and Windows Live were miraculously able to change their algorithms within a day or two so Obama’s biography no longer appears. Makes you wonder why they couldn’t fix it in all the intervening time but were able to do so now. In the last nine months of 2008, Bill Clinton made at least $150,000-a-pop speaking to groups in some of the very places where his wife now will now represent American diplomacy, from India to Kuwait to China to Malaysia. In fact, the latter three speaking stops came in the last month-and-a-half of the year, as the Clinton and Obama camps were hammering out the agreement under which President Obama ultimately offered Hillary Clinton the job as top diplomat. The National Bank of Kuwait paid Bill Clinton $350,000 for a Nov. 16 speech, while Hong Kong’s Hybrid Kenetic Automotive Holdings shelled out $300,000 for a talk Dec. 4 and a Malaysian foundation paid $200,000 for Clinton to speak the very next day in Kuala Lumpur. Is anyone naive enough to believe foreign countries will not expect special consideration for the money paid? The whole situation reeks of corruption and pay-to-play. Change we can believe in again. Illinois Governor Blagojevich’s office released a list of subpoenas relating to his scurrilous practices this past Saturday . Lo and behold! After loud denials that any of Obama’s advisors were among that august group it turns out we have been misled (again). David Axelrod, Obama’s Karl Rove, is in there, as is Chief of Staff Rahm Emanuel and Valerie Jarrett. Obama’s good friend and financier Tony Rezko made the A-list too. This was reported in the Chicago Sun-Times and on Fox News on Saturday, the Quad City Times on Sunday, then the Chicago NBC affiliate on Monday. And that seems to be it; two local papers, the local news, and a quasi conservative TV channel. I keep looking for mention of it in my local paper, or on the national news. Where is the New York Times? The Washington Post? CNN? All the major networks, the AP, McClatchey? Would they wilfully refuse to report news of such portent? Or under report it? Isn’t this worthy of not only mention, but thorough investigation? Have they no sense of responsibility to the public, only to Obama? A Google search shows this story is being covered by bloggers and just about no one else. And the most ironic part of thiestory? The subpoenas only came to light because of a two year battle and freedom of information requests from the Better Government Association, an organization established in 1923 by a group of citizens trying to fight the growing influence of the corrupt Al Capone gang. Think about it. If this had been George Bush’s Karl Rove receiving a subpoena wouldn it be all over every news outlet in the country, repeatedly and loudly? And that Al Capone connection – they would fall all over themselves drawing comparisons between the corrupt Chicagoan of the 1920’s and the Bush administration. But this isn’t Karl Rove, it’s David Axelrod. And Rahm Emanuel, and Valerie Jarrett, and Tony Rezko, and other friends of Obama. How about some comparisons between the corrupt Chicagoans of that era with the current batch? Read the whole article, if you’re brave. 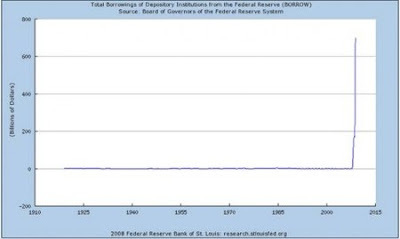 As bad as the economy and borrowing from the fed are, it may well get worse. Many economists expect Obama’s stimulus plan to be a drag on the economy instead. It will take money out of the private sector for use by the government, and apparently use it according to race, gender, and socioeconomic status. I don’t think any hopey changey stuff is coming my way. In fact, as a local politician the speculation among my peers is that the proposed economic stimulus package will more likely make providing services to our communities more difficult. Is Global Warming Theory in its Death Throes? When the weather won’t cooperate and those who think your theory is a joke are on the ascendancy, it might be time to admit the science on global warming isn’t settled. Following the January thaw, which came right on schedule in my area this week, we are back into the single digits again tonight. In fact, we are averaging about 7.5° below last year for the month of January. Some scientists expect the cooling to continue for years. Weather is really making news in the United Arab Emirates. They don’t even have a word in the local dialect for what has happened there. Watch the first minute or so of this clip on YouTube – you won’t be able to understand a word he’s saying, but that’s okay. All you need is the visual. The United Arab Emirates, on the southeast coast of the Arabian peninsula, with snow? RAS AL KHAIMAH // Snow covered the Jebel Jais area for only the second time in recorded history yesterday. So rare was the event that one lifelong resident said the local dialect had no word for it. According to the RAK Government, temperatures on Jebel Jais dropped to -3°C on Friday night. On Saturday, the area had reached 1°C. Major Saeed Rashid al Yamahi, a helicopter pilot and the manager of the Air Wing of RAK Police, said the snow covered an area of five kilometres and was 10cm deep. “The sight up there this morning was totally unbelievable, with the snow-capped mountain and the entire area covered with fresh, dazzling white snow,” Major al Yamahi said. Are incidences of colder than normal temperature related in any way to the fact the Average Magnetic Planetary Index, a good indicator of the sun’s activity, continues to sink lower? 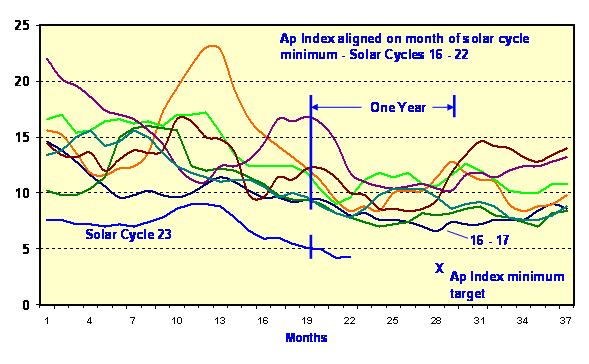 The following graph aligns solar cycles since 1932 by their minima, and we are coming out of cycle 23. That is the blue line on the bottom. Notice it is about four points weaker than cycle 16-17, the weakest prior to the current one. Can it be getting cooler on earth because the sun is less active? Meanwhile, a report authored by Eric Steig et al came out this week claiming Antarctica is getting warmer. It is an unusual paper, if for no other reason than his conclusion that the area is warming at the rate of 0.25° every 25 years, with a margin of error of 2-3°. I’m not a scientist, but I know that if your margin of error is ten times greater than your conclusion, your data is worthless. Steig’s conclusions are disputed by Ross Hays, a former CNN meteorologist who now works for NASA. Let me first say that this is my own opinion and does not represent the agency I work for. I feel your study is absolutely wrong. There are very few stations in Antarctica to begin with and only a hand full with 50 years of data. Satellite data is just approaching thirty years of available information. In my experience as a day to day forecaster that has to travel and do field work in Antarctica the summer seasons have been getting colder. In the late 1980s helicopters were used to take our personnel to Williams Field from McMurdo Station due to the annual receding of the Ross Ice Shelf, but in the past few years the thaw has been limited and vehicles can continue to make the transition and drive on the ice. One climate note to pass along is December 2006 was the coldest December ever for McMurdo Station. In a synoptic perspective the cooler sea surface temperatures have kept the maritime storms farther offshore in the summer season and the colder more dense air has rolled from the South Pole to the ice shelf. There was a paper presented at the AMS Conference in New Orleans last year noting over 70% of the continent was cooling due to the ozone hole. We launch balloons into the stratosphere and the anticyclone that develops over the South Pole has been displaced and slow to establish itself over the past five seasons. The pattern in the troposphere has reflected this trend with more maritime (warmer) air around the Antarctic Peninsula which is also where most of the automated weather stations are located for West Antarctica which will give you the average warmer readings and skew the data for all of West Antarctica. With statistics you can make numbers go to almost any conclusion you want. It saddens me to see members of the scientific community do this for media coverage. Speaking of media coverage, the BBC is so desperate to promote global warming that they have spliced parts of Obama’s inaugural speech together out of order, to prove he supports saving the planet from global warming. Read the above paragraph again and think of the implications of journalism sinking this low. The BBC totally misrepresented what the new president of the United States said by taking phrases out of context, splicing them together, then not only playing it as if it were one continuous quote, but also commenting on it. This really is StinkyJournalism. And when your promoters have to/are willing to resort to such dirty tricks, you have become a laughing stock. While the rest of the country swoons over Obama, let’s look at some concrete ways to determine whether he is successful in his handling of the country. These should be no-brainers from my point of view. 1. The bipartisan Congressional Budget Office has released a report saying Obama’s requested economic stimulus package will be too much, too late. They say most of the money he is requesting will be spent in years three and four of his term, which will be too late to have any effect on the recession (but just in time to help his chances for re-election?). For example, of $30 billion in highway spending, less than $4 billion would occur over the next two years. Of $18.5 billion proposed for renewable energy, less than $3 billion would be spent by 2011. And of $14 billion for school construction, less than $7 billion would be spent in the first two years. The CBO expects the recession to be deep and hard, but no one thinks it will last any more than two years. The stimulus package appears to be nothing more than a big pork project designed to benefit Congress and Obama much more than the economy. HOW TO JUDGE SUCESS – Obama will be putting the country and the people first if: he accepts the CBO report, acknowledges that leaving the money in the economy through massive tax cuts would be a much quicker and greater stimulus, asks Congress to pass the necessary legislation to cut taxes, and abandons his economic stimulus package. 2. The much-maligned George W. Bush kept us free from repeat terrorist attacks for over seven years after 9-11. Unfortunately, today Obama signed an Executive Order outlawing legal interrogation methods. That might make it a bit harder to get information from those who would do us harm. HOW TO JUDGE SUCCESS: Every day that streak continues is a success. However, if Obama sells Israel down the river for some amorphous “mideast peace,” he loses all his accrued points. 3. The global warming hoax is beginning to unravel under its own weight – or maybe the weight of all the snow and ice piling up again this year. The sun is experiencing its longest quiet sunspot cycle since the Dalton Minimum, the Pacific Decadal Oscillation has switched to cool, the Antarctic sea ice is near record levels and the Arctic is getting there too, the Pacific is in another La Nina cycle, and people all over the world are realizing we have had several cold years in a row. Many are no longer accepting the ridiculous statement that global cooling is caused by global warming. Yet warmist adherents tell us the earth is still warming. What gives? 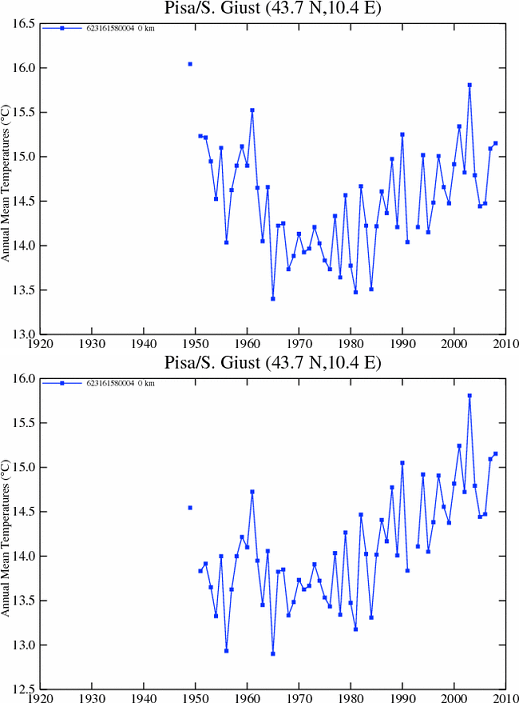 The above charts are of average yearly temperatures in Pisa, Italy (you know, the place with the Leaning Tower). The top chart shows the annual recorded temperatures, while the bottom chart shows the “adjusted” yearly temperatures. Notice anything unusual? While recent years correspond, for some reason temperatures from about 1970 or so back have been changed, or “adjusted.” They now show the area was much cooler back then than it was recorded at the time. Does anyone really believe their adjustments are more accurate than the authentic readings? Yet those adjusted temperatures are the data they use when calculating the amount of “global warming” taking place. If the earth has stopped getting warmer, adjust history. Voila! your theory is still viable! You can still claim it is warmer now. This is data from only one station. There is a lot of data manipulation going on to “prove” manmade global warming. Obama has appointed Carol M. Browner, a rabid believer in global warming, to be his climate czar. She is a socialist, and until recently was one of 14 leaders of a socialist Commission for a Sustainable World Society, which believes in global governance and the necessity for developed countries to shrink their economies. In short, she believes in controlling the nation’s energy to control the nation’s economy. HOW TO JUDGE SUCCESS: Obama also believes new regulations are needed to prevent global warming. If he studies research on both sides of the issue, fires Browner, and cancels all cockamamie plans to control carbon output while more legitimate scientific research is done he will be a success. Regulations for clean air and clean water are one thing, but regulations to limit or prohibit the use of coal and oil based on pseudo-science? That is merely a means of economic control. And for men to think they can control the weather is hubris to the nth degree. I believe we deserve a Treasury Secretary (who will be over the IRS, by the way) who is not this careless. I don’t know how much money you have to make to pay $34,000 in taxes, but it is a substantial amount. If he is careless with his own money he will be careless with our money. HOW TO JUDGE SUCCESS: If Obama withdraws Mr. Geithner’s name from consideration and appoints someone who is honest and careful he will be a success. If he doesn’t, he will show us his talk of hope and change is merely words. So, four easy gauges of success. How do you think he will do? As his first official action after being sworn in, President Barack Obama signed three documents Tuesday, including a proclamation declaring a day of national renewal and reconciliation. Why do I suspect it is conservatives who are supposed to reconcile themselves to him, rather than that he also needs to respect the opinions of others? Those who believe the Founding Fathers were inspired when they created our Constitution and our country need more than “just words” from him. Words are nice, and proclamations can be very attractive once framed, but actions are what counts. Calling for reconciliation while making no effort to address the boorish behavior of supporters shows that he brings empty rhetoric. How much booing and jeering “nah nah nah nah, hey hey, bye bye” would the massive security forces in attendance have tolerated had it been aimed at Obama? Common decency and courtesy are beyond those who did this, for no matter what their beliefs George W. Bush has been their president for eight years and deserves respect. When I was a kid one of the worst things someone could say to you was “Your mama would be ashamed of what you just did.” Somehow, I suspect their mamas were proud, booing right along with them. Is this what our society has come to? This behavior reflected poorly on Obama, not Bush, because it was he who had shown by example that rude and dismissive behavior is acceptable. Remember the incident where he gave Hillary “the finger” on camera during a speech and smirked as the audience laughed? He leads, they follow. He has also shown us, with willing complicity from the media, that facts are fungible. Inconvenient ones disappear and are replaced by others created out of thin air. His official presidential website now brags about how he immediately came to the aid of Hurricane Katrina survivors while the Bush administration was unprepared and left behind broken promises. No words are wasted on truthful nuances, no efforts at identifying rightful responsibility, just promises of largesse under Obama. Meanwhile his supporters have left behind Hurricane Latrina. They couldn’t even bother to clean up after themselves. But why should they? Everything is now the government’s responsibility, and the government has plenty of money to waste use creating jobs picking up trash. Here is a view of The Mall in yesterday’s aftermath. I will pray for Obama’s success, that he have the wisdom to make appropriate choices and the strength to follow through on those choices. I will pray that he be able to stand up to those who believe they own him and the Democratic party and expect favors in return for their massive financial contributions. I will especially pray that we are still a free capitalist society at the end of his term in office. God help us all. Please.